Updated Tuesday February 10, 2015 by FABA. If there are more than 9 players on the roster, how much time will my player get on the field? Does every player get an equal amount of playing time? If my player wants to play a particular position, will he/she get the opportunity? Will my player get time in the infield or mostly in the outfield? Are we keeping score at this level? Statistics? 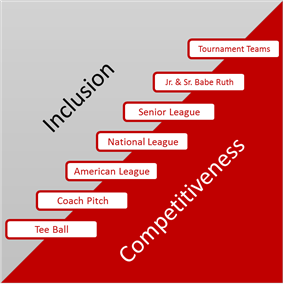 At FABA, we have standards for the level of competitiveness and Inclusion that players and parents can expect at each age level. Younger divisions are more inclusive allowing players and coaches to more easily discover individual abilities and preferences. Older levels are more competitive as we teach players how they each play their part on a winning team. This document explains FABA’s standards for each division. Bench time will be evenly distributed among all players. Players begin to gravitate toward positions for which they show performance. Everyone gets time in infield if desired. Everyone who wants to pitch should get at least 2 innings/season. Players continue to gravitate toward positions for which they show performance. Everyone gets time in infield, though not necessarily equally. Pitching is up to coach, but should be inclusive. Bench time will be distributed among all players, though not necessarily equally. Positions are assigned by coach based on performance and interest. Pitching is up to coach, but should be somewhat inclusive. Pitching is up to the coach.